Are you a fun person who loves to throw big parties and invite guests at your place? Parties are surely entertaining where you can relax, enjoy, socialize and offer people your hospitality. But after party cleaning can be a laborious job. Sometimes so much that it kills the spirit. Maid Service-NYC is your solution to the problem of cleaning after parties. We are a full maid service that specializes in offering up to mark cleaning services to its customers. Now you can plan on arranging grand parties without worrying. We have a trained team of professionals for cleaning homes and apartments. Depending upon the type of party, the place can be littered with plastic and disposable plates, props, banners, balloons, cups, ribbons and all form of supplies. There is definitely spilling of liquids here and there along with some bad stains that may ruin your carpet and curtains. Our team carefully works all over the place and sanitizes it. Our ladies will assort the litter into recyclable material and general garbage. They are then disposed off in proper garbage bags with recyclable material separated. Vacuuming the carpeted areas and removing stains from them. Toilets are thoroughly washed, cleaned, scrubbed including bowl, sink, tub and showers. They are also disinfected. Counter tops and sinks are dried and shined. 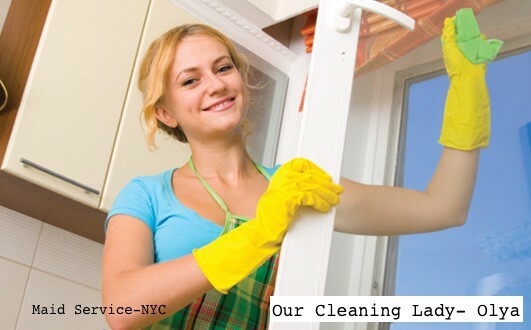 Maid Service-NYC is a green clean certified company. We use only organic biodegradable solutions for cleaning purposes. These are both safe for health and do not cause allergy. Houses with kids can especially benefit from our green cleaning services which leaves their house germ free and kid friendly where they can easily crawl on the floor and play.